In the modern day world, technology is everywhere helping streamline business. Emails can offer speedier replies than the post office and file rooms have become a thing of the past, replaced by data files instantly accessible on a computer. While technology has many major benefits, the personal touch behind the business can become lost. We all have dreaded calling a customer service line where you must first listen to many options and then press several buttons to finally get to the correct department. The human relationship is gone. When calling Aviation Insurance Resources (AIR) for an aircraft insurance quote, many pilots are amazed at the fact that there is always a human on the other line. Pilots never find themselves dialing numbers to get to the correct agent. A pilot and agent will answer the phone and be happy to get you to the right place. It is that personal touch and enthusiasm that will follow you through the process of the aircraft insuring process and to renewals for years to come. 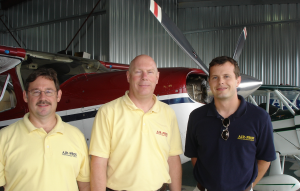 All agents at AIR are pilots or come from a strong background in aviation. When you call AIR, you will always find yourself talking to a person who is as excited about your aircraft as you are. Whether you are looking for flying club insurance or flight school insurance, Cessna 150 insurance or King Air insurance, all of our agents at AIR will take your needs personally as if it were their own. To find out more about Aviation Insurance Resources and to receive a free aircraft insurance quote, please contact Aviation Insurance Resources by calling 877-247-7767 or visit AIR-PROS.com today. You can also follow us on Facebook, Twitter, LinkedIn, and Google+.